A purpose-built resort made up of 4 villages at different altitudes, Les Arcs offers stunning views across the valley to Mont Blanc. The resort can seem dominated by tall apartment complexes but the friendly locals and car-free streets help to give it a fantastic atmosphere all year round. Arc 2000 is the highest of the villages and has the quickest access to the higher and more demanding skiing in the area. Just below that is Arc 1950, which is conveniently arranged and pleasantly built in a traditional style. Arc 1800 is the largest and the liveliest of the villages and hosts a wide range of bars and restaurants. Sitting lower down the valley and connected by a funicular train to the valley town of Bourg St Maurice is Arc 1600. Les Arcs has some rewarding local skiing featuring long descents, steep slopes and excellent tree-lined runs. It’s major advantage though is being part of the extensive Paradiski area which opens up access to some of the most varied on and off-piste skiing in the world. 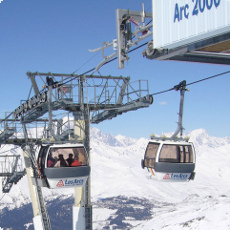 The fast cable car link with La Plagne is the best way to start exploring the broader area. Les Arcs and the Paradiski feature varied terrain with a good percentage of high, snow-sure slopes above 2000m, as well as low-level woodland runs. There are a host of blue runs for beginners, and all the main routes have both easy and difficult alternatives which make it an ideal resort for mixed-ability groups. It has also become a hot spot for snowboarders with excellent free-riding options and one of the best snowparks in the region. Snowbus offer an excellent shared transfer service between Geneva airport and Les Arcs, with tickets for just £49pp single and £80pp for a return journey. Our comfortable minibuses and coaches run at regular intervals on Saturdays and Sundays, picking up and dropping off at convenient locations in the villages of Arc 1600, 1800, 1950 and 2000. We also have a stop at the low-cost UCPA accommodation in Arc 1600, and shared transfers on Wednesdays and Fridays are available from Bourg St Maurice with a connection to Les Arcs by funicular train. Private taxi transfers also run seven days a week between Geneva and Les Arcs hotels and chalets. Grenoble airport transfer buses run on Saturdays throughout the winter. Convenient timings and cheap prices make it a perfect option for individuals and small groups to travel. Snowbus vehicles stop at all Les Arcs villages - 1600, 1800, 1950 and 2000 - plus the UCPA building. Grenoble shared transfers are just £53pp single and £88pp return which makes it an excellent low cost transfer method. We also provide private transfers for groups of any size between Grenoble and Les Arcs which give a quick door-to-door taxi journey for skiers and snowboarders. Private transfers are available at any time and day of the week between Chambery airport and Les Arcs hotels. We can organise taxis, minibuses and coaches for individuals right up to parties of 60 and more. Private taxis give you flexibility and convenience, with your driver meeting you when you land and taking you directly to your hotel door. Chambery airport provides easy access to the local motorways and so is the quickest airport journey time in the area. Lyon airport is a little further out than the other transport hubs, and tends to see less skiers pass through it - but it is a busy international airport and provides some excellent options for passengers travelling from destinations outside of Europe. Snowbus can arrange taxis for transport directly to your hotel or chalet door to make the journey go as quickly as possible. All our drivers are experienced in winter conditions and know the local roads which allows them to avoid traffic at busy periods of the day.